Hospitals and medical centers are embracing the digital revolution. Going are paper-based records and traditional x-ray films. Patient records have been digitized and radiologists view computerized x-rays on a monitor, alongside digital file notes and comparative images. These Picture Archiving and Communications Systems (PACS) are changing the way these doctors work. Radiologists now spend extended periods in front of large, specialized screens which can strain eyes and cause numerous ergonomic issues. ISE's PACS Workstations are the solution - they combine RISE height adjustability, innovative monitor arms and ISE's ability to fully customize the workstations to fit each individual hospital's needs. The Straight Cutout Station offers a value proposition for any hospital. 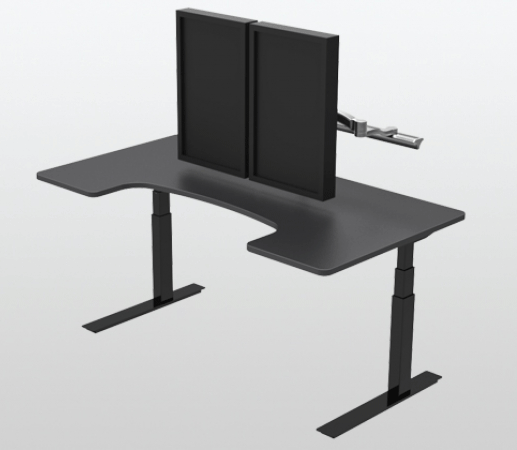 The RISE height adjustable base, Leader keyboard system and heavy duty monitor arm solve ergonomic issues and create a versatile and reliable solution. The PACS electric workstation provides for easy individual user adjustment within a multi-user radiology reading room. 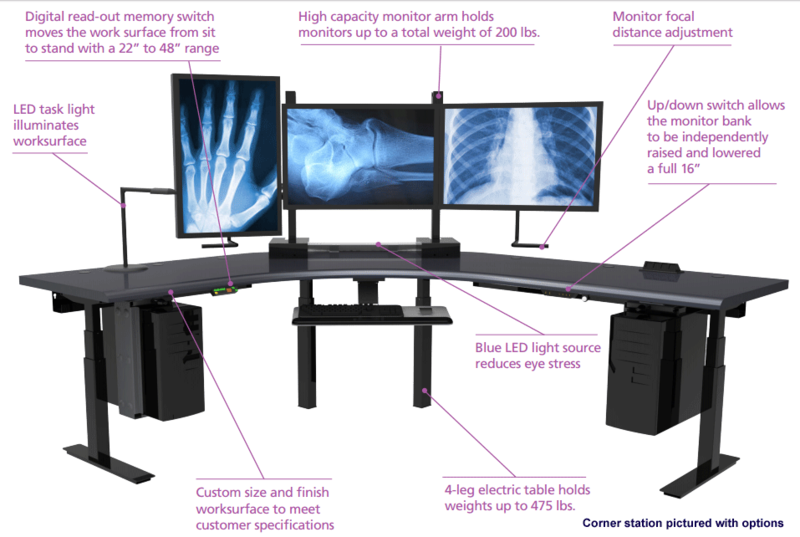 A radiologist can quickly adjust the PACS workstation and monitors to suit their body type and viewing preference, enabling them to work productively over long periods of time in ergonomic comfort. 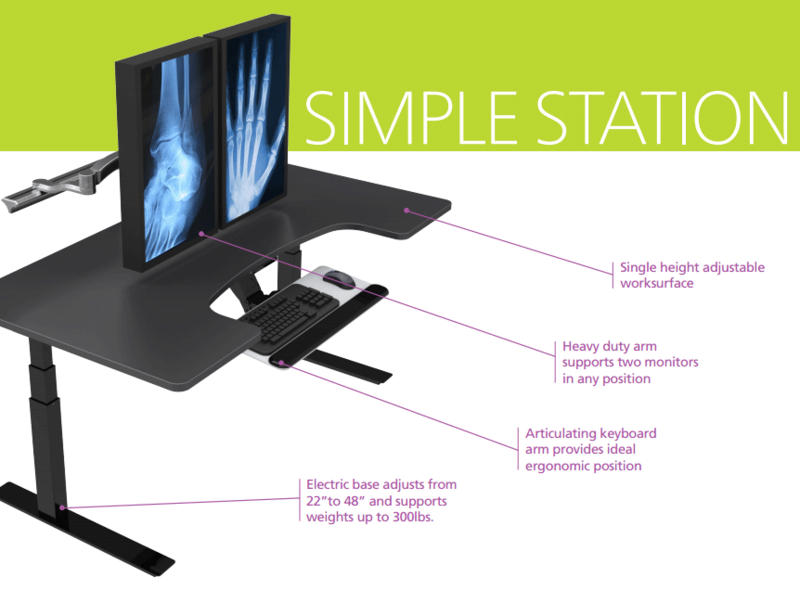 The Simple Station includes a 2-Leg electric height adjustable base with an integrated keyboard platform that provides for separate keyboarding and monitor worksurfaces. 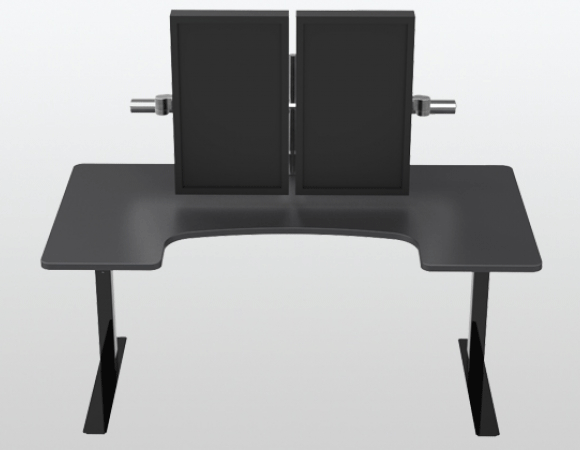 The monitor worksurface has a sit to stand height range from 22” to 48” high (RISE model) controlled by a programmable digital read-out memory switch. The keyboarding surface has a height range of 8.25” (2.25” above and 6” below) and a tilt range of +10°/-15°. 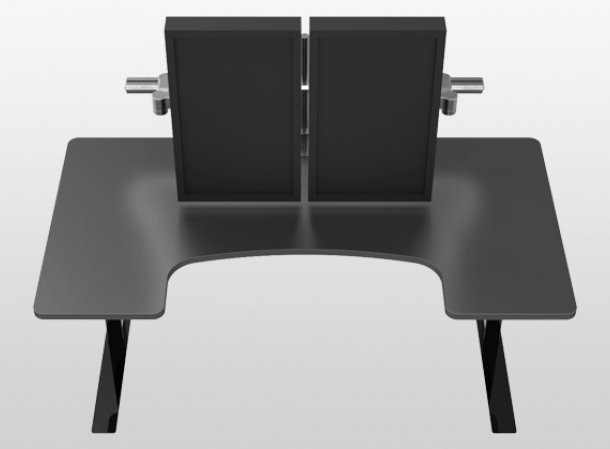 An optional beam mounted monitor arm system can accommodate two radiology diagnostic monitors. Other options include CPU holders with a weight capacity of 85 lbs., and desktop power and USB units. For radiologist visual comfort, a blue LED light source reduces eye strain, and a LED desk light illuminates the worksurface. Every hospital has different needs, and we will customize PACS Desks to fit those requirements. Please contact us for further information. SKU: ST-RCS-3072 - 30" (D) x 72" (W) - Actual 29" x 71"
6: Accessories - Note - Monitor arms are not included. Please call us for a list of all optional accessories including monitor arms.